Star Pets sells top quality pet products, including licensed apparels, toys, training and accessories for all per fans! Always at the lowest prices and with an excellent team of customer service to guarantee satisfaction to all of our customers! For customer service inquiries or to initiate a return, please contact Star Pets at starpetsco@gmail.com. Pets First Plush Football Catnip Toy! Reward your pet in having hours of playtime fun. This Officially NCAA licensed football toy is made of 100% soft team color plush and features an embroidered team logo. Yarn tassels are attached at both ends and loose catnip is added into the poly filling for pet's enjoyment. Give your pet some team spirit with this Pets First plush football catnip toy! * Oval soft plush shaped ball - 4" long x 2" wide. * Yarn tassels 1.5" long each attached on both ends. Available in 9 Collegiate Teams! Alabama Crimson Tide, Florida Gators, Georgia Bulldogs, Kentucky Wildcats, LSU Tigers, Ohio State Buckeyes, Oklahoma Sooners, Oklahoma State Cowboys, Texas Longhorns. Choose your favorite team and Add to Cart Now! Dimensions 7.0 In. X 2.0 In. X 2.0 In. 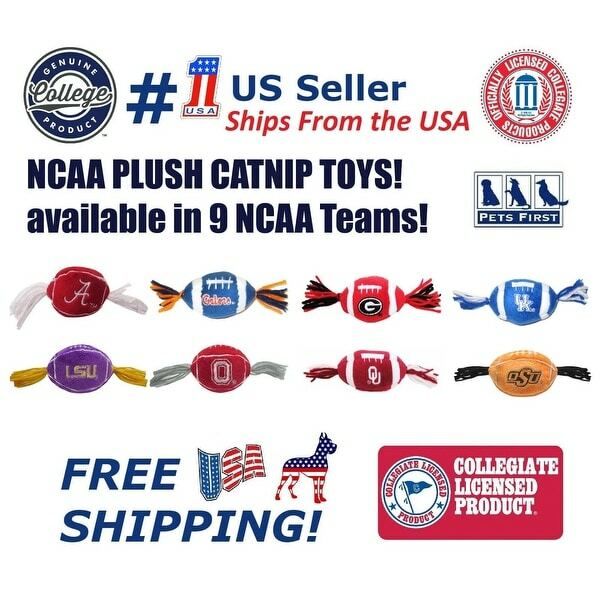 First time I have seen NCAA cat toys. Wish I had seen this during football season. I just rescued a kitten and I'm a HUGE Ohio State Buckeye aficionado!! !